Came back from Delhi to Scotland as the Spending Review was announced. The level of the deficit made hard choices inevitable but I believe that Liberal Democrat ministers have worked hard to ensure that the decisions were based on fairness. Below is Danny Alexander’s message to party supporters. “When we came into office, we inherited an economy that was on the brink. With the largest budget deficit in Europe and no plan for tackling it, Britain faced huge economic risks. These could only be dealt with by a clear plan to deal rapidly with the worst financial position this country has faced for generations.On Wednesday, we set out that plan. And while the scale and pace of the action we need to take is unavoidable, we can choose how we do it. The Spending Review sets out those choices: to spread the burden fairly, to promote economic growth, and to invest in the life chances of our children. These are hard choices that affect millions of people, but they are the right choices to set our country back on the road to prosperity. We have spread the burden fairly by protecting the key services that the most vulnerable in our society rely on. Social Care has been given a funding boost worth £2bn, the NHS and schools have been protected and our plans for social housing will deliver up to 150,000 new affordable homes. We have promoted future fairness through a £7 billion ‘fairness premium’ that will support improving the life chances of our poorest children from their first pair of shoes to their first pay packet. We have promoted future growth by giving the go ahead to key transport projects that will unlock economic potential in every part of the country. We have also delivered on a Green Investment Bank that will kick start green investment and generate jobs. And we are pushing forward with radical reform. Our decentralisation agenda will reduce the number of central government grants from 90 to fewer than 10. With the exception of schools and public health, ring-fences on council spending will disappear, giving local authorities much greater flexibility. We will deliver welfare reforms that simplify the system and make work pay. And our criminal justice reforms will roll out the community justice programmes that were pioneered by Liberal Democrats in local government. Yes, it’s going to be tough, and everyone will make a contribution, but those with the broadest shoulders will bear the biggest burden. That’s why we’ve reduced taxes for the low paid, and increased them for the richest. It’s why we introduced a banking levy – and we’ve made it our aim to extract the maximum sustainable tax revenues from the banks that got us into this mess. Last year’s Bigman 2 event was a huge success and so I was delighted to get news about this year’s event which promises to be even bigger. The Bigman 3 Festival is an event that celebrates Maryhill, its canal and its people. Now in its 3rd year we are changing the format to include a big level of audience participation, but with a twist. This year the Big idea for the Bigman event is to have YOU take centre stage. 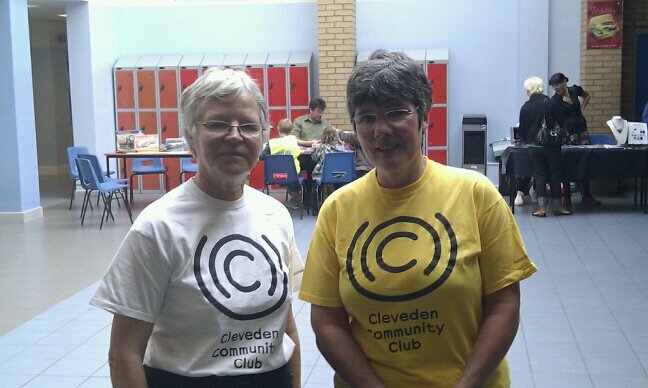 Working with Clyde 1, the entertainment will be provided by You – 200 of you we hope! In the run up to the 18th September we want to recruit people to come and join in Dance & Singing rehearsals in local venues that will lead to a massive community performance on the day of the event. 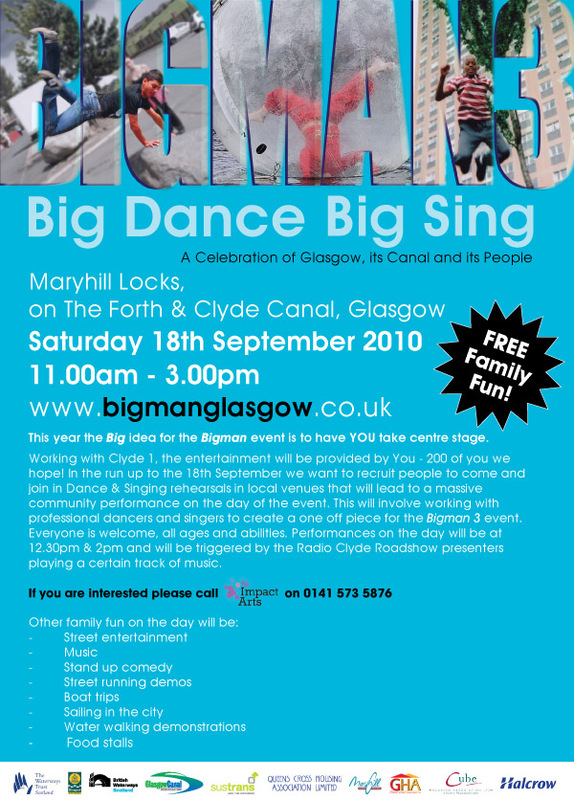 This will involve working with professional dancers and singers to create a one off piece for the Bigman 3 event at Maryhill Locks, 18th September – 11am-3pm. Think Don‘t stop believing but bigger, everyone is welcome, all ages and abilities. Performances on the day will be at 12.30pm & 2pm and will be triggered by the Radio Clyde Roadshow presenters playing a certain track of music. If you are interested please call 0141 573 5876. At the heart of the festival is the Bigman project itself – The Maryhill Bigman, designed by celebrated sculptor Andy Scott, will stand on the Stockingfield Junction of the Forth & Clyde Canal in Maryhill, Glasgow. 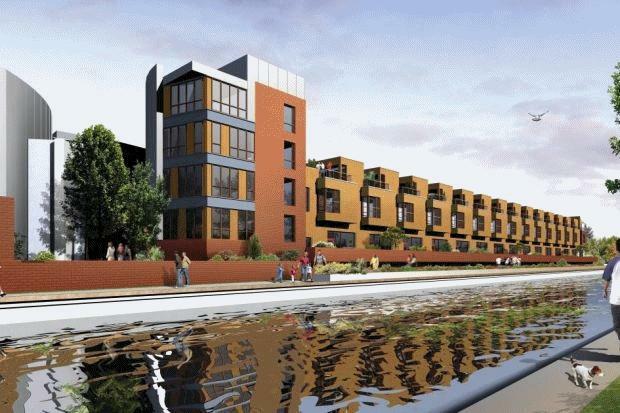 It is a support for a new proposed footbridge over the canal. Rather than a simple steel construction Andy has designed a sculpture which will act as the support for the bridge. It will appear as though the sculpture is lifting the bridge up from the banks of the canal, and will create a very impressive feature for the area. It will be made of steel and Andy will design and make the construction models at his workshop studio in Maryhill where he has worked for over 16 years. This is where Andy made many well-known sculptures for Glasgow and other places, including the famous “Heavy Horse” which stands on the M8 motorway at Easterhouse. Ending the week on a positive story, though one constituents should not have faced. Yesterday I was contacted by parents at Summerston Child Care which is based within Bellcraig Community Centre which is managed by Glasgow Life (formerly Glasgow Culture and Sport). Earlier this year a fight between a group of young adults, involving knives, a machete and a hammer, spilled into the Centre. All too easily these people could have walked straight into the nursery as there was no security system to stop them. Fortunately, though not for staff, the fight stayed in the main reception. 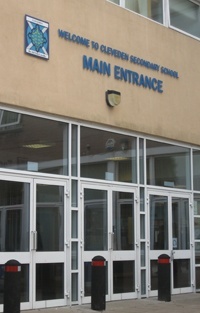 Strathclyde Police subsequently carried out a full safety assessment at the Centre which resulted in the installation of a controlled entry system to the nursery area. Yesterday parents and staff at Summerston Child Care were told that Glasgow Life’s Health & Safety Officer had instructed that the system be removed as a Health & Safety issue. Yes, the same organisation that runs the Centre, and installed the security system, had now removed it. 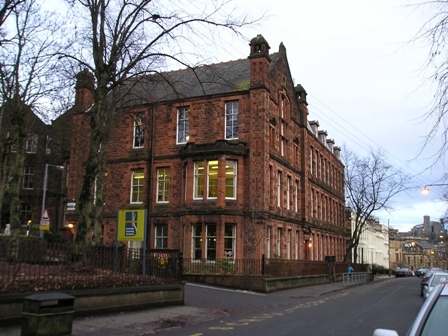 Needless to say parents quickly contacted their Councillors to voice their concerns and I contacted Glasgow Life who advised that as the system wasn’t hard wired into the fire alarm system it posed an unacceptable risk to users of the Centre. Now you might think that Glasgow Life should have thought of this before they installed it, however to add insult to injury they then raised the prospect that Summerston Child Care might have to pay for any new system! After several e-mails and phone calls, commonsense seems to have prevailed and Glasgow Life promise me that the original system will now be reinstalled on Monday morning, following this Glasgow Life will now review all of the recommendations in the original Police report and agree an action plan with the users of the Centre. Parents are obviously relieved by the news and hopefully Glasgow Life have taken some lessons on board.